Welcome to Day #2 of Chocolate and Nibs Theme Week. Bisou Chocolate (Oakland, CA) is a San Francisco Bay Area-based company that creates hand-crafted, dark chocolate bars from sustainably sourced cacao grown in multiple origin countries. Thank you to Gary and Pat for this bar and the introduction to Bisou. Always delighted to discover new chocolates and chocolate makers, in our own backyard no less. Today's Bisou Dark Chocolate Nibs Matagalpa (Nicaragua) 87% cacao bar* had a smooth, slightly creamy and crunchy texture and a dark, deep slightly earthy flavor. This three-ingredient bar was made from: cocoa beans, organic whole cane sugar and organic cocoa butter. 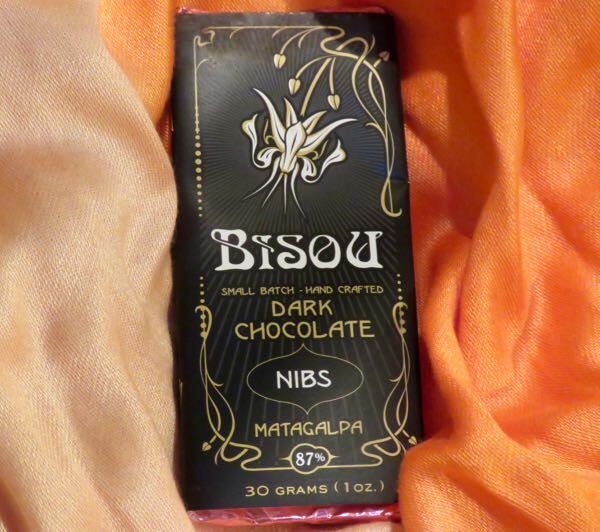 *Note: As of today, the 87% Nibs Matagalpa bar from Bisou Chocolate is sold out (on their website). However, one can hope that it (or a similar batch bar) might reappear in the future.